Avoid pesky mosquitoes this summer when you invest in a screened in porch. They provide a great return on investment! There is nothing quite as peaceful as enjoying life outdoors on a beautiful spring, summer, or fall day – that is, until mosquitos and other bothersome insects start invading your personal space. Not only are mosquitoes pesky, but they carry dangerous diseases that could harm your health and well-being. 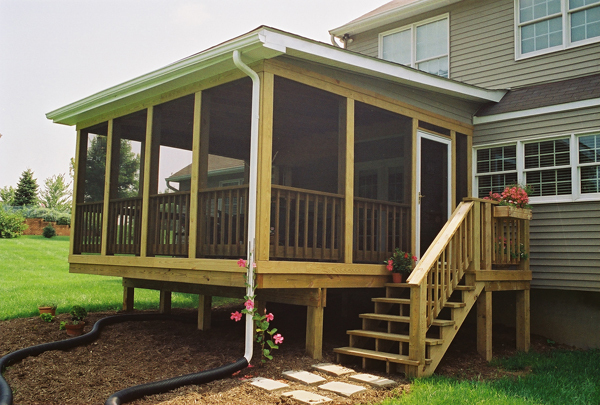 Screened porches, pagodas, and gazebos provide the perfect solution to enjoying your outdoor space without the hassle and hazard of unsightly insects. Mid-Atlantic Deck and Fence is here to elaborate. As we mentioned, one of the greatest advantages of screen rooms outside of your home is the ability to minimize the interruptions and discomfort caused by insects. After all, how truly valuable is your outdoor space if you don’t have the opportunity to enjoy it during the hottest months of the year? With screen protection, you can feature your outdoor furniture for use all-year-round. Screened porches can be designed with advanced features to suit your needs like ceiling fans or electrical outlets, making them the ideal place to relax outdoors with family and friends. When you are investing in a screen room, you can do so with confidence. This investment has an incredible return on investment of roughly 75 percent, which is incredibly high as far as home improvement projects are concerned. If you plan to sell your home in the future, this feature could be incredibly beneficial when it comes to landing the right buyer. If you plan to stay in your home forever, you will get to reap the benefits of your screen room for years to come – and that, is priceless. So, what are you waiting for? 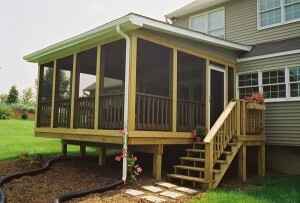 Are You Ready to Talk to Someone About Your Screened Porch?